Need help getting approved for a high risk ACH account? Need help getting approved for a high risk ACH processing account? We help high risk merchants with ACH processing. We are full service payment consultants and brokers of ACH processing accounts. We specialize in the higher risk merchant types, and especially business lenders (we have more business lender clients than any other types). We have relationships with several of the most trusted processors to high risk merchant types and can help you get approved for one or more accounts. We know which processors will accept certain merchant types based on underwriting criteria and which ones won’t accept – so when you work with us, you don’t have to waste as much time getting declined at a bunch of places. Don’t waste time floundering – get an advocate on your side that will help make the process of getting new ACH processing accounts easier than it would have been otherwise. We are like the “easy button” for high risk ACH debit and credit payments. To make the process easy, we start with the “pre-app” and your last three to six months of processing and bank statements. With this in hand, we contact our processing partners (typically the President or VP level) to have them do a preliminary review. They will look at chargeback rates and volumes and look at your website – and if all looks good, then one or more will invite you to apply. Each processor has their own application but all will require the same supporting documentation (more on that below). For high risk processing, the pricing proposal is always after the full application is accepted by underwriting as complete. Underwriting typically takes a couple days once all the required documents are all submitted together in one package (like a .zip file). Then if accepted, each processor will present the pricing (think of this like a proposal) and our clients can choose the offers they like best. We typically always recommend having at least two ACH processing accounts – that way, “just in case” anything were to happen with one account, you already have another account. With ACH processing, the designation of “High Risk” can be a result of your business type but also because you have a large average transaction amount (typically >$1500). If a payments processor professional has told you that your business type is high risk, then it probably is. Regardless of why your business is considered high risk, it is possible to get an account – and while we cannot help all clients, we do have a pretty good success rate for clients that can submit a “full application package”. We work with a diverse client base but do a lot of work with legal and licensed short term consumer lenders with brick and mortar stores that follow state usury laws and help business lender merchant cash advance business funding clients. If you are tired of getting declined and want a friend in the processing business, then contact us. Our goals are perfectly aligned with yours – we don’t get paid if we don’t help our clients get approved and start processing. There are no costs to apply or work with Prineta. We are independent agents with nearly a dozen ACH processors so we set up accounts directly with each processor and earn a small commission on the backend for bringing them the account. So its really a no cost, no risk proposition for clients of Prineta. Use the form at the bottom of the page to contact us about ACH processing. Include your website URL and we will email you back. Given recent industry changes, what may have been an acceptable business type with low fees 3 years ago, may now be considered high risk and it is more difficult to get approved for an ACH account. That’s where we add value as consultants. We know which processors will accept high risk and have a good track record of getting clients approved for accounts. And for merchants that have been cut off from ACH and had an account shut down or had their account severely restricted, we do have some ACH alternatives (such as Check21 Remotely created checks (RCC) and an ACH alternative called instant eCheck conversion. The alternatives understand that some merchants that deal with certain customer demographics need higher return rates than others and typically allow higher return rates than the NACHA rules. This post is for high risk ACH processing accounts; for retailers that want to accept paper checks, we have different check processing services. When it comes to per transaction costs, funds availability / days hold, or discount rates, our partner providers always try to customize rates or get rates matched if clients provide statements with other processors. Enjoy the best pricing available in the industry through our connections. Accounts with no discount rate percentage are available to brick and mortar lenders and other “qualified” merchant types with good processing statements (low unauthorized returns). Some accounts feature multiple ODFIs (if one ODFI can’t process a transaction, the transactions can switched to another ODFI). As far as the services our partner providers offer, they have a virtual terminal for setting up single or recurring payments, SFTP for uploading bulk files, API interface and NACHA file format. The image below is one screenshot example of one of our virtual terminals but each processor has a different/unique virtual terminal (secure online web portal for managing the account). All of the accounts we set up allow for recurring ACH debits according to a define payment schedule. After the crack down on online payday lending, many lenders that survive are evolving into line of credit installment lenders. 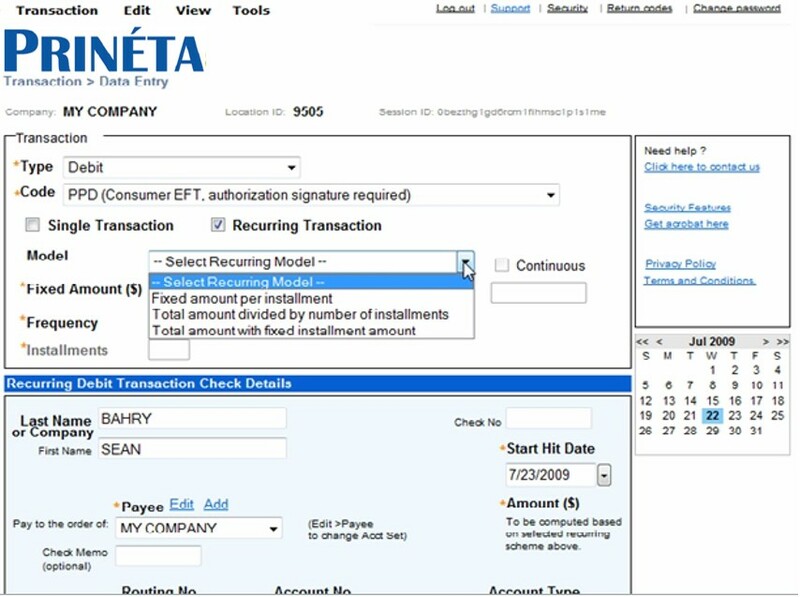 Here is a presentation on what Prineta offers for installment lenders. All of the primary partners we work with have robust APIs that can be integrated into loan management systems (LMS) or other back-office software systems with methods available for web services SOAP XML, TCP/IP client program with built-in scripting commands, and HTTPS SSL Post interface for clients that want to automate payment processes. 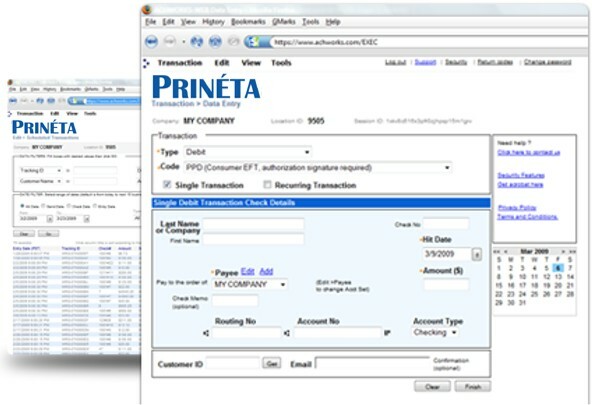 We have helped several clients integrate the ACH processing payments systems and procedures and have a technical background – the ability to understand the technical aspects is yet another differentiator (unique benefit of working with Prineta). These platforms have been operational for a number of years and are mature and stable. The following are considered high risk businesses that may require additional review and possibly verification of compliance with all regulatory bodies for the specific industry. Note – Some of these business types often require a reserve and/or discount fees. Installment lenders offering Line of Credit (LOC) loans pursuant to Delaware law with “choice of law” may lend online with processors that accept LOC jurisdiction and state licensing. All merchant applications must be fully completed, signed and guaranteed by greater than 50% shareholder(s), or an individual authorized to enter into a binding contract on behalf of the corporation, LLC, LLP (Partnership), or Sole Proprietorship. All applications will require a non-starter voided check or bank letter on bank letterhead signed by a bank representative, prior processing statements with other processors, and depository bank account statements. Most accounts will require the owner to have a credit score over 600, no prior financial crimes on their record, and a personal guarantee. Consumer Credit, Consumer Lending, Debt Consolidation Services, Private Student Loan Companies, Mortgage Modification, Credit Counseling and other sub-prime facing financial services industries are typically considered “prohibited” by most processors. But with a clean processing history (low percentage of R10 chargebacks) and clean internet reputation, it is possible to get an account. If you have a processing history, underwriting will want to look at your Chargebacks / Stop Payments with Return Codes R05, R07, R08, R10, R29, R51. We can help you understand what underwriting is looking out for so you can improve your chances of getting approved. We can help you get accounts with multiple processors for business continuity, diversity, and load balancing; just ask. Our service provider partners are recognized industry leaders in payments processing for lenders and collection agencies. Tools like Check Verification, Back Office Conversion, and ACH Fed File Checker (ACHFileChex) enable our clients to maximize their success rate and ultimately, their profitability. Our clients typically report greater cash flow control and quicker account resolution. Telephone collections and payments can be debited the next business day. Our clients enjoy fast and easy approval processes, competitive per transaction processing fees, and reject item (return) fees that are lower than most traditional processors. In the message box, please include a description of what you need and the situation, your website URL, and actual or estimates for: Average Number of Transactions Per Month, Average Amount of Each Transaction, Average Total Number of Returns Each Month, and Average Unauthorized Return Rate (Return Code R10’s typically need to be below 1%). Need ATM Services in Western Missouri?